Aston Villa F.C. centre forward Christian Benteke recently agreed a contract extension with the club through to 2017. This came less than two weeks after he had submitted a transfer request in an attempt to force a move away from the club. Below we will analyses the impact Christian Benteke has on and off the field for Aston Villa and why awarding the Belgian international a new and more lucrative contract over double his previous wage was a financially sound move for Villa. Following his arrival from Belgian side Genk last summer Christian Benteke scored 23 goals in his first season at Aston Villa. Scoring 19 league goals Benteke was integral to keeping his club in the Premier League and avoiding relegation from the top-tier in English football for the first time in 26 years. Benteke was the fourth highest scorer in the Premier League last season and his chance conversion of 26% was only bettered by Frank Lampard’s 28% according to Opta Stats. 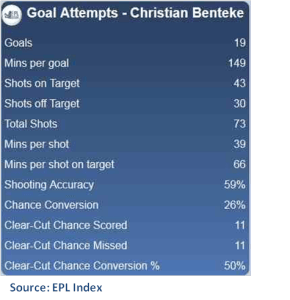 The impact of Benteke’s goal scoring ability off the field is perhaps not as well publicised. His presence and goals played a major part in ensuring Villa’s place in the Premier League for the 2013/2014 season. The club is now set to benefit more financially than in any other previous year due to the increase in Premier League broadcasting money. Premier League broadcasting money includes television and prize money made up from domestic and overseas payments. The vast majority of the money is distributed among the 20 Premier League clubs whilst around 10% is given in ‘parachute payments’ to former Premier League clubs. The Founder Members’ Agreement of the Premier League rules that domestic revenue is distributed as follows: 50% is divided equally between the 20 clubs, 25% is awarded as a “merit payment” to each club according to where they finish in the league and the remaining 25% is paid in “facility fees” which are awarded every time a club’s match is shown on television. Clubs also receive overseas revenue which is paid by countries outside of the United Kingdom for coverage of the Premier League. In the 2012/2013 season the total broadcasting amount of £1.06bn was handed out with £972m distributed among Premier League clubs and the remainder as parachute payments. In the Premier League domestic television revenue and prize money accounted for just under £593.5m whilst overseas television income was £378.5m. Aston Villa received a total of just under £45m. The graphic below displays where Aston Villa finished in the league, how many of their games were shown live on television and how the total payment was made up. Without the 14 points contributed as a result of Benteke scoring Villa would have ended up on 27 points finishing 19th in the Premier League two points ahead of QPR who finished bottom and one point behind Reading in 18th. Instead of earning £4.5m for finishing 15th Villa would have received only £1.5m for finishing 19th: a loss of £3m. Facing relegation Villa would have missed out on the lucrative television and prize money the 2013/2014 Premier League season is set to offer. The financial implications of Benteke’s impact in his first season will be seen on a greater scale in the new 2013/2014 Premier League season. From this season onwards domestic revenue for Premier League television rights will increase from £1.7bn for the 2010-2013 seasons by just under double to £3.196bn for the 2013-2016 seasons following the league’s new deals with Sky and BT worth £3.016bn in addition to the existing BBC rights worth £178m. This is on top of overseas television income believed to be worth in the region of £2bn. A staggering £1.73bn will now be distributed among the 20 Premier League clubs in the 2013/2014 Premier League season. This means that each Premier League club will now receive in the region of £24m as an equal share and around £30m from overseas television revenue. The merit payment will rise in increments of approximately £1.2m with 20th place receiving this figure and the title winners being awarded around £23m. The “facility fee” will depend on how often a club’s matches are broadcast live on television and are worth an estimated £900k per appearance; the star appeal of Benteke certainly makes Villa a more attractive TV proposition for the match selectors. Using the figures from the 2012/2013 season and taking into account the increased parachute payments for former Premier League clubs I have estimated the expected television revenue and prize money for Aston Villa in the 2013/2014 Premier League season were they to finish in the same position. The table below indicates how much Villa could be expected to receive and gives an indication as to how vital Benteke’s impact was last season in ensuring Premier League survival. Aston Villa would therefore be set to receive around £70m for their participation in the Premier League this season should they finish in a similar position to last season. If Villa had been relegated to the Championship they would have received less than half the above amount. A parachute payment, yet to be confirmed following recent changes by the Premier League, is likely to have produced between £20m-£25m in the first season. Around £2m would also have been awarded from the Football League for television rights following the new broadcasting agreement with Sky Sports. This means Villa would have received in the region of £25m-£30m from television revenue and prize money for participating in the Championship this season; a figure which would reduce if any further seasons were spent in the second tier of English football. The awarding of a lucrative contract extension to Christian Benteke believed to be in the region of £3m per year (including bonuses) makes financial sense for Aston Villa. The club is set to pocket between £65m and £100m for their participation in the 2013/2014 Premier League season from television revenue and prize money. This is more than double the amount of money Villa would have received by playing in the Championship. On the field Benteke’s decision to stay will improve Villa’s chances of progressing in the Premier League and in cup competitions after three difficult seasons. Off the field Benteke is a big name at Villa Park and his signature on the dotted line should lead to increased season ticket purchases and Benteke replica shirt sales. Should Christian Benteke have another productive season and do well at next year’s World Cup he may again be tempted to leave depending on the success of Villa’s 2013/2014 campaign. Randy Lerner will not let go Benteke go cheap, however, and Aston Villa will be set to gain financially from the Belgian international once more.